The Philippian Jailer: The Virtue of Being "Contemptible"
The Virtue of Being "Contemptible"
What makes King David such a wonderful study is the extent to which we can not only be inspired by his triumphs, but also identify with his follies. At least this is true for me. His experience in bringing the Ark of the Covenant up to Jerusalem is one which cuts me to the heart. Fresh off his anointing as King of Israel and subsequent defeat of the Philistines, David was understandably riding high. That God had proven so faithful to exalting this shepherd boy from obscurity to royalty ought to have weighed heavily on David, but at this point he became arrogant and careless. This would be inexplicable were David not a sinner like me, easily intoxicated by his own success. Awash in confidence, David yet sensed that that the Ark ought to come to Jerusalem, but he delegated its movement to his underlings. He'd managed to neglect what made the Ark so astonishing--that its purpose was to represent God's holy and immediate presence among His people, and that it therefore was to be approached but once a year, by but one carefully prepared representative, and only with the blood of that special sacrifice which was for the sins of the people. But after all, David was the king ... a very important man. David had already started to forget that he was king only because Israel had rejected the King of Kings in favor of his predecessor, Saul. Here was the perfect opportunity for David to lay his own glory aside and firmly reestablish God's sovereignty. Instead, he busied himself with various kingly duties in Jerusalem as his minions casually transported the symbol of the Lord's holy presence on a cart. One of these minions--the unfortunate Uzzah--would pay for David's sloppy arrogance (and his own) with his life. David's next step was naturally to throw a pity party, banishing the Ark to Obed-edom's household. But as was often true with David, he eventually regained his composure and responded to God's chastisement. 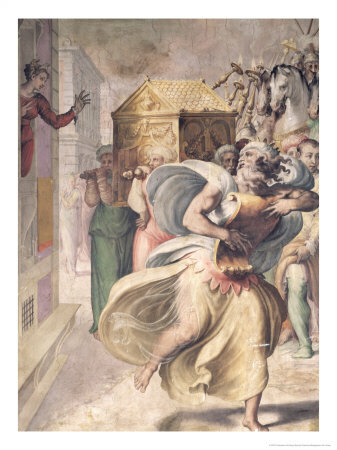 David humbled himself, took off his royal robes, and "danced before the LORD with all his might" as the Ark was moved reverently and properly by the priests. To his credit, he risked becoming undignified and disrespected before the "important" people in Jerusalem in order to humble himself and thus exalt his God. As usual, I find more to identify with David in his folly than in his victory. Like him, I get utterly lost in the task of ensuring the fleeting and illusory wonderfulness of my own life and legacy. Rather than "consider everything a loss compared to the surpassing greatness of knowing Christ Jesus my Lord", I am preoccupied with my earthly treasures. Rarely do I doff my "royal robes" and throw myself before God's throne with anything approaching reverent abandon. I'm too busy protecting my worldly image and the things that bolster it, for fear that I may lose the respect of those who don't ultimately matter. Thanks for this timely reminder of what and Who ultimately matters in our lives.